Well over a year ago, I started a series called Oh Karen! 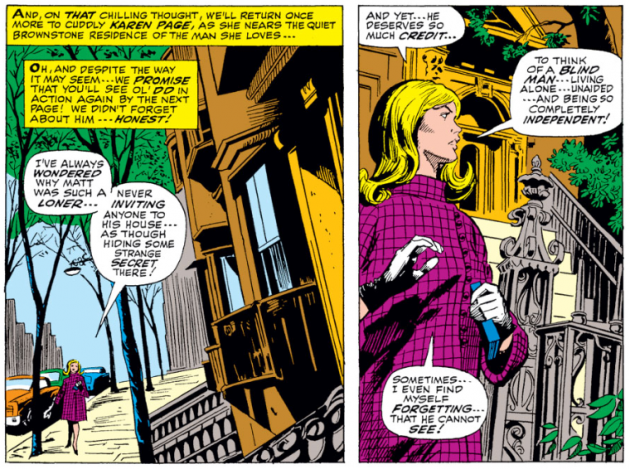 that was intended to chronicle the life and times of Karen Page, from the first issue until her death many decades later. This was all going nicely until I realized recently that I hadn’t added any new chapters to Karen’s story in well over a year. For shame! If you’re new to this site, and are curious about what happened to Karen before issue #30, have a look at the first three posts in this series. Karen is right on when she calls Mike’s Thor costume ridiculous. 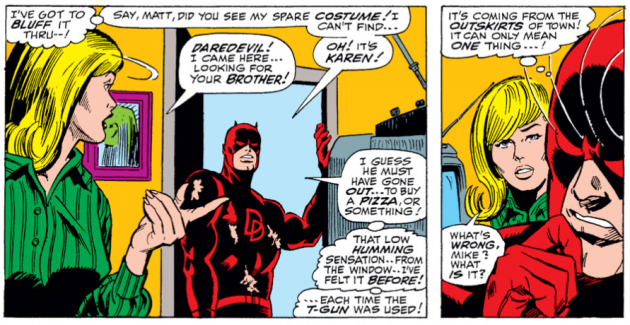 However, to me, the most ridiculous thing about this costume is that he still seems to be wearing it over his dark sunglasses, just as he apparently does with the regular Daredevil costume. Note to all decent people: If your significant other should suddenly go blind, mourning the fact that they can’t see how pretty you are should be pretty far down the list, and not the first thing that comes to mind. Just saying. A couple of questions come to mind here: How the *beep* does Matt have that phone set up with the receiver off the hook? And, almost as importantly, who will look after the store while they’re gone? Will Matt make up some nonsense about what he did at work while the others were gone? At the very least, he doesn’t seem to care about their little business at all. 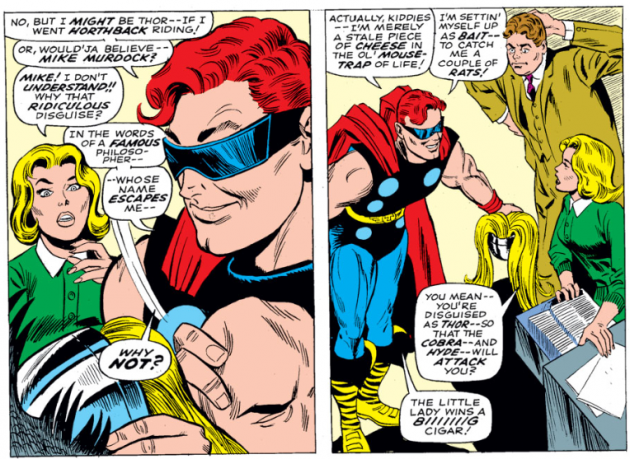 I’ve said it before, but how Nelson & Murdock managed to turn a profit, or even break even, is a mystery to me. But enough of this trying to actually make sense of Matt’s actions. Let’s return to Karen, shall we? Later in the same issue, Daredevil goes off to fight the Beetle while Foggy and Karen are stranded next to their train to Montreal, which isn’t going anywhere because of the unsolved robbery on board. 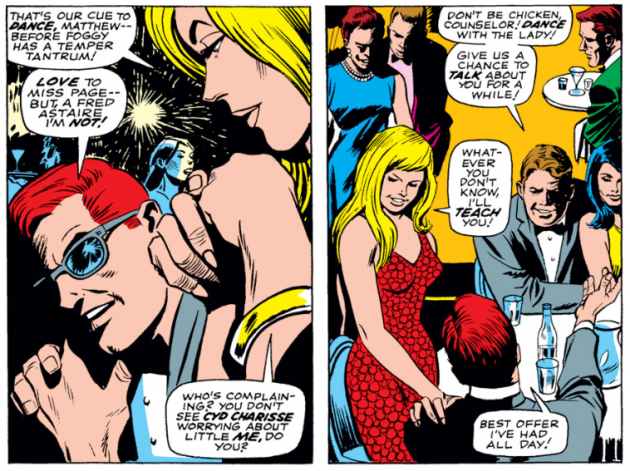 Foggy doesn’t hesitate to complain about Mike’s antics while coming awfully close to tell Karen about his feelings for her. 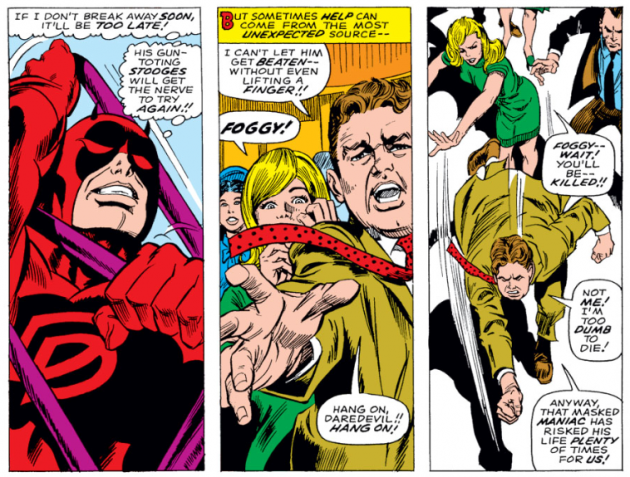 Daredevil is captured by the Beetle in a most embarrassing manner and threatened with having his identity exposed to the world, as shown in “You know you’re having a bad day when…” This is when his two friends step up to the plate. Who ever would have thought Foggy could fight like that? 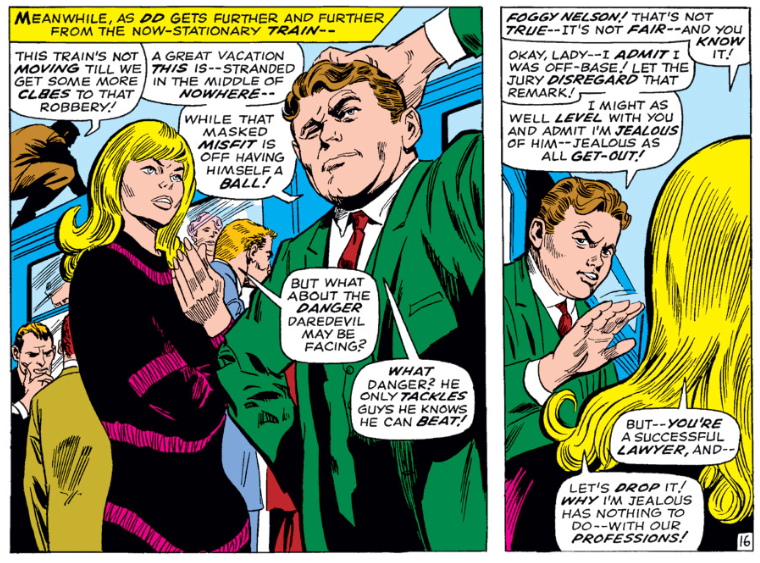 By Daredevil #36, the law partners are safely back in New York, and things are happening in Foggy’s life. He is asked to run for District Attorney and Karen couldn’t be happier. 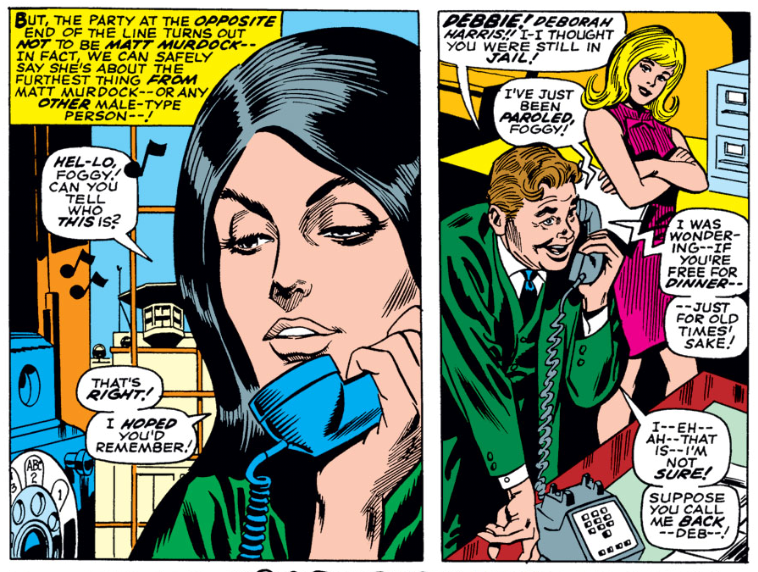 While the two are rejoicing, Foggy gets gets quite a surprise when former girlfriend and convict Debbie Harris calls him to catch up. 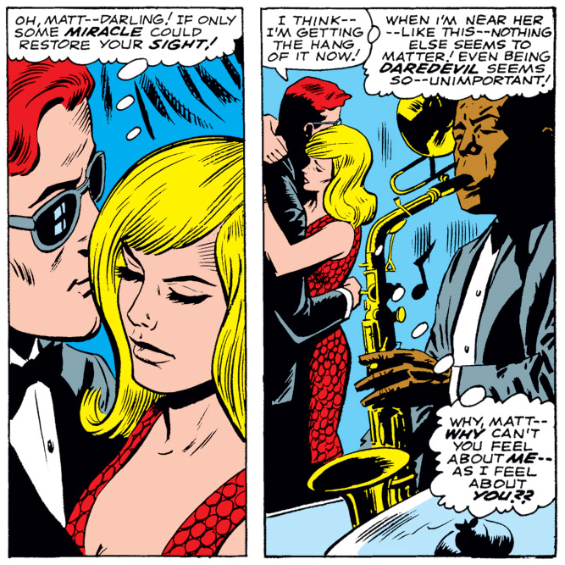 Later in the issue, Matt and Karen get the opportunity to spend some time together on the dance floor. This is a pretty romantic scene that sees the two love birds once again failing to communicate their true feelings for each other. Unfortunately for our quartet of shy love birds, a fellow by the name of the Exterminator shows up and sends Debbie and (later) Matt into another dimension. I think we’ve all been on dates where we’ve wished that would have actually happened to our date. To Foggy’s distress, Debbie is missing until issue #41. 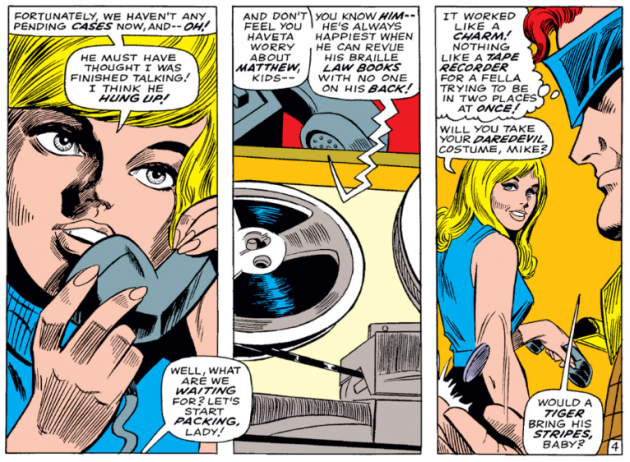 Matt didn’t actually join her there until issue #40, after the visit to the restaurant, so his disappearance is something of a mystery to his co-workers. 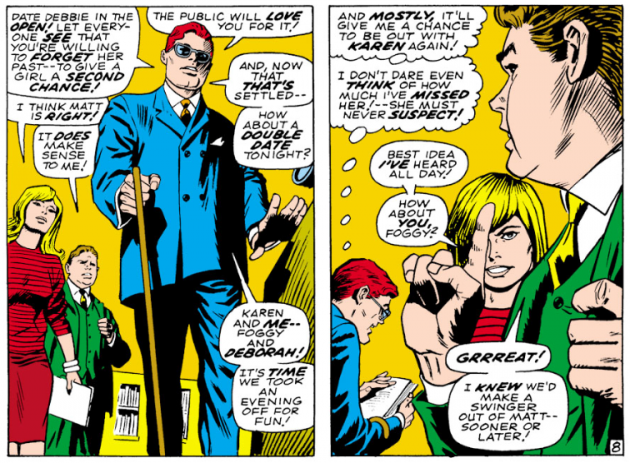 All this gives Karen food for thought in Daredevil #41, the issue which promises the death of Mike Murdock. Worried about Matt, Karen decides to do some detective work and shows up at Matt’s house for what is apparently the first time. 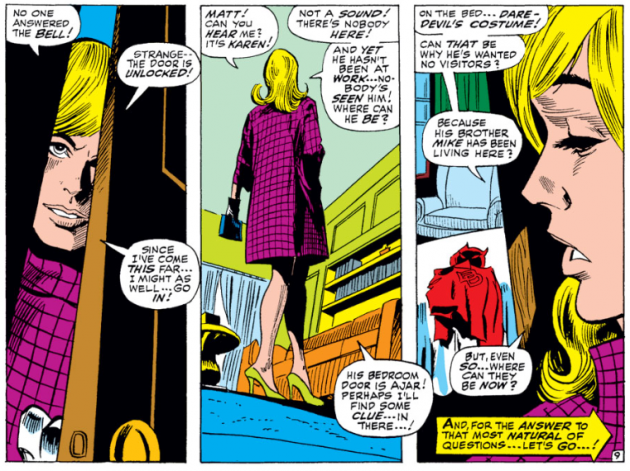 Before long, Daredevil shows up, and quickly gets Karen out the door. 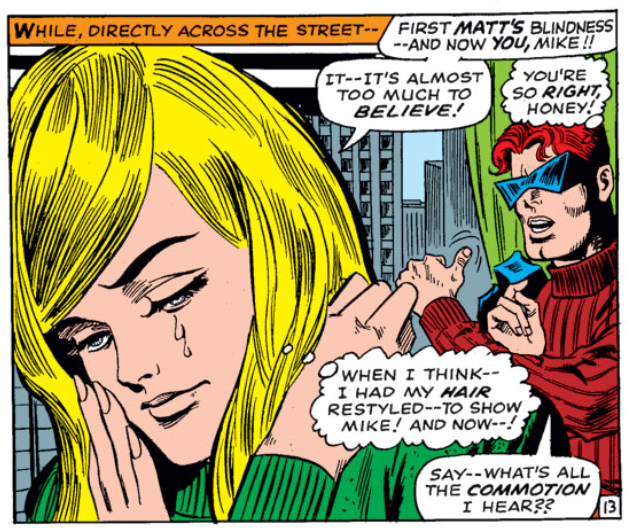 This would be the last time Karen would see “Mike Murdock,” as he is presumed dead at the end of the issue when pieces of his costume are found in the Exterminator’s lab following a small explosion. Good riddance! This also makes for a perfect spot for me to leave Karen’s adventures until the next installment of Oh Karen! where we’ll see things return to normal (or not) around the law office. Reading some of the dialogue from the 60s drives me batty with its over-use, in wholly inappropriate situations, of ellipses and hyphens. Even if you just think of them as something like pauses in speech, they still make no sense! No wonder Karen’s so disappointed when “Mike” can’t see her new hairdo. 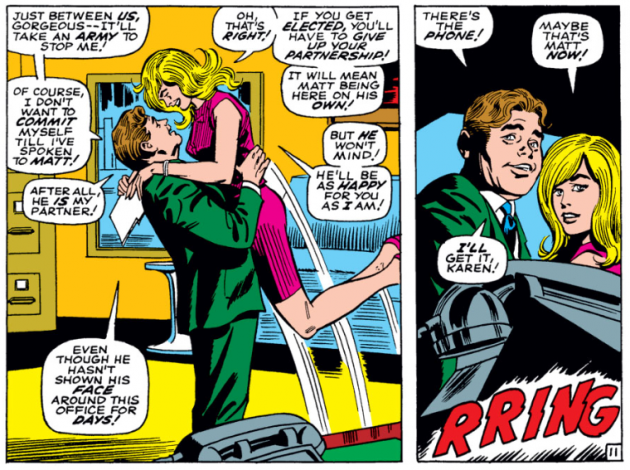 The only way she could reasonably secure a man would be to overcome her ridiculously annoying speaking cadence with overwhelming beauty! Reading though your Oh Karen! 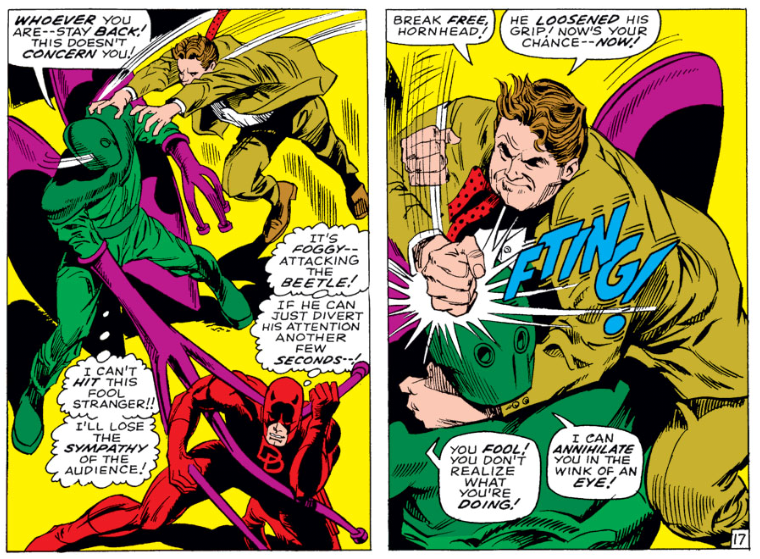 posts has allowed me to pin down, for the first time, exactly why I loved the Lee/Colan issues of Daredevil so much. Lee was writing a superhero screwball comedy, where one damn thing just happens right after the other, and logic be damned as long as it’s fun. Bringing Up Baby with super-powers. 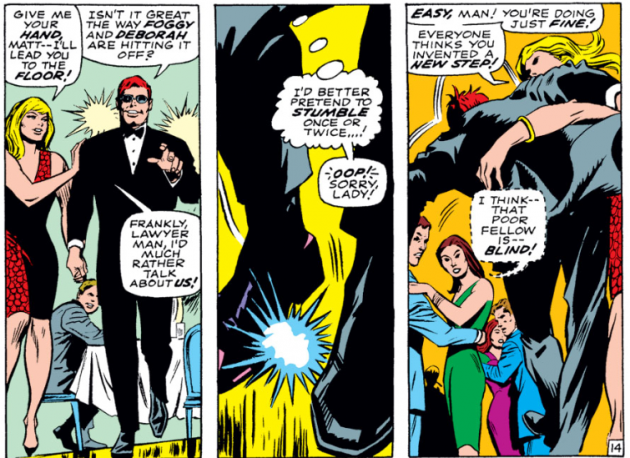 Picture a young Cary Grant as Matt Murdock and Marilyn Monroe from Monkey Business as Karen Page, and you’re not far off. Matt pretending to stumble to avoid talking about *gasp* feelings. So adorably awkward.